Perhaps the greatest writer in the Spanish language the world has seen, Miguel de Cervantes Saavedra was born c. 29 September 1547 in Alcalá de Henares, Habsburg, Spain. It is said that his most famous work Don Quixote has been translated into more languages than any other book except the Bible. Rather little is known of Cervantes's youth. What is known suggests his family was far from well-to-do. His father, who was deaf, was a barber-surgeon, a poor paying job at that time. Possibly due to their low income status, the family moved around a lot when Cervantes was a kid. Regarding his schooling, next to nothing is certain, but it is a hot topic of debate among modern scholars. It is very possible, based on analysis of his later literary work, that Cervantes was taught by the Jesuits. One fact is certain. Cervantes was an avid reader as a child. Cervantes's first foray into the field of writing came in 1569 when he contributed some poetry to a collection compiled as a memorial after Elizabeth of Valois, the wife of Spain's King Philip II, died. But according to Cervantes himself poetry was not his strong point. Interestingly, for some reason not known now, Cervantes was forced into exile in this same year, and he moved to Rome. Cervantes hung up his quill, as it were, and worked for a short time as chamber assistant to a cardinal before joining a Spanish military unit stationed in Italy in 1570. As a soldier, he fought with distinction against the Ottoman Empire in the Battle of Lepanto in 1571 aboard the ship La Marquesa. During this conflict he sustained several serious, debilitating injuries. He suffered "two chest wounds and the complete maiming of his left hand" (Biography.com). Despite these terrible injuries Cervantes continued to serve as a soldier for a further five years. Compounding on his injuries suffered during his years of service, Cervantes was captured in 1580 by Turkish ships while attempting to return to Spain. He was imprisoned and for the next five years forced into slavery. After numerous failed attempts to escape, he finally gained freedom after his family paid a ransom for his release. Safely back home in Spain, Cervantes decided to dust off his quill and resume writing. His first novel, La Galatea, was published in 1585. Unfortunately, this his first novel was not exactly a rip-roaring success among his contemporaries. To make ends meet, he took up a job as a purchasing agent for the Spanish Armada, which might sound impressive but was really nothing more than collecting grain from rural communities. Perhaps disillusioned by this grunt-work he decided to try his hand at writing for the theatre. Plays were all the rage in Spain at that time and becoming a successful playwright promised lucrative career possibilities. Alas, none of his plays were show-stoppers. We are perhaps fortunate that he did fail as a playwright. If he had been successful we may never have had the tremendous benefit of his most famous work Don Quixote. Cervantes published the first part of Don Quixote in 1605. This novel "tells the story of an elderly man who becomes so enamored by the old stories of brave knights that he seeks out his own adventures. The title character soon gets lost in his own fantasy world, believing he is one of these knights, and convinces a poor peasant, Sancho Panza, to serve as his squire. In one scene, the deluded Don Quixote even fights a windmill, mistaking it for a giant. Quixote finally regains his senses before the novel ends" (Biography.com). It is from this novel that the phrase 'tilting at windmills' to suggest madness was coined. This novel was a huge success, but since authors didn't receive royalties for their work at this time, it did not make Cervantes a wealthy man as it undoubtedly would have now. In fact, it has now been translated into over 60 different languages. Cervantes eventually went on to publish the second part of Don Quixote in 1616. This story has inspired many authors and artists through the centuries. It inspired the musical The Man of La Mancha and an artwork by Pablo Picasso. On 12 November 1957 France issued a set of seven stamps featuring a cast of foreign celebrities (Célébrités étrangères). 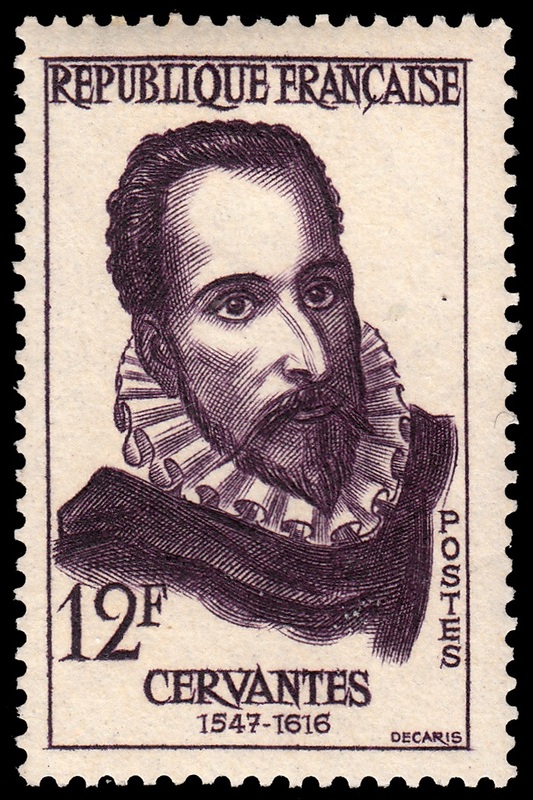 One of these stamps features Miguel de Cervantes. It was designed and engraved by Albert Decaris. Decaris here manages to capture the brooding intelligence of Cervantes as he gazes into deep into his own creative imagination. Studying this portrait we could well believe Cervantes is right at that point of conceiving that quirky character, Quixote. A splendid portrait by the Master Engraver.